Mandela is no more and is occupying the centre stage of all news… the African Nation is still mourning the death of Mandela – they braved driving rain for hours to praise Nelson Mandela but the crowds at his memorial service were unable to hide their wish to bury his successor. Tens of thousands of people, who spent most of the day singing, swaying and dancing, booed every time that President Zuma appeared on the screens inside the FNB stadium. The reports state that in front of 90 world leaders - including Barack Obama and David Cameron - the crowds booed Mr Zuma persistently. They stuck their thumbs down and even used rotating hand movements - normally used to call for substitutes at football matches. Archbishop Desmond Tutu scolded the crowd. "You must show the world you are disciplined. I want to hear a pin drop," he said. But it was too late. The crowd had already showed the world what they thought. The booing surprised even the South African media. The theory went that Mandela's legacy celebrations should bolster Zuma's image, who flaunted his closeness to Mandela. We have moved a long way since times when we had only Doordarshan for viewing……….. DD has also grown from its modest beginning with experimental telecast way back in Sept 1959 in a makeshift studio. Regular transmission started in 1965 and DD had a 5 minute news bulletin in the same year. Ms Pratima Puri was the first newsreader. Salma Sultan joined Doordarshan in 1967 and later became a news anchor. In 1982, Doordarshan as a National Broadcaster came into existence. Krishi Darshan was the first program telecast on Doordarshan. It commenced on January 26, 1967 and is one of the longest running programs on Indian television. Viewers will for sure remember that on Sundays Doordarshan used to show news for deaf and dumb. From the days of ‘washing powder nirma …. And I love you Rasna….. Goldspot, the zing thing…’ – commercials have grown by leaps and slowly some of main features also were stopped. Can you imagine that people waited patiently to see 6 or less songs in a programme called ‘Oliyum Oliyum’ [sound and light]…. Telecast on Fridays. This news for ‘hearing impaired’ people was a good attempt to take DD to those who cannot practically hear ……….. 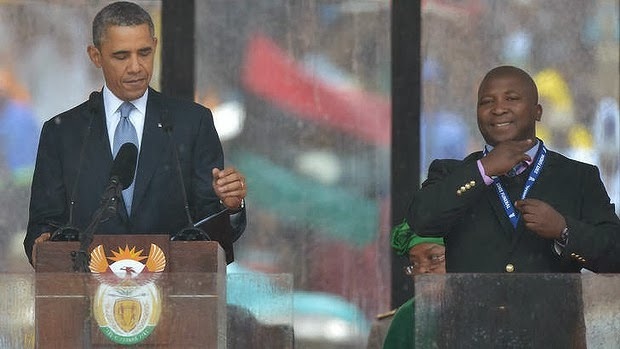 Miles away, there is outcry over the signs made by an interpreter….BBC and other news agencies report that deaf viewers of Nelson Mandela's memorial service have complained that the official sign language interpreter was a fraud who was "signing rubbish". The Deaf Federation of South Africa told the BBC the man's signs were "arbitrary" and "did not make sense". The man, who has not yet been publicly identified, was seen on stage signing as friends and family of Mr Mandela, and world leaders, paid tribute to the former South African president. The government is investigating. It said on Wednesday it had as yet been unable to get to the bottom of the allegations "due to the demanding schedule of organising events related to the State Funeral". But, in a statement, the government said it "wishes to assure South Africans that we are clear in defending the rights and dignity of people with disabilities". Major national and international news channels broadcast Mr Mandela's state memorial service live on Tuesday. The man, suited and wearing a pass around his neck, stood next to key speakers such as US President Barack Obama and Mr Mandela's grandchildren translating their eulogies. During the broadcast, Wilma Newhoudt-Druchen, South Africa's first deaf female MP, tweeted: "ANC-linked interpreter on the stage with dep president of ANC is signing rubbish. He cannot sign. Please get him off." 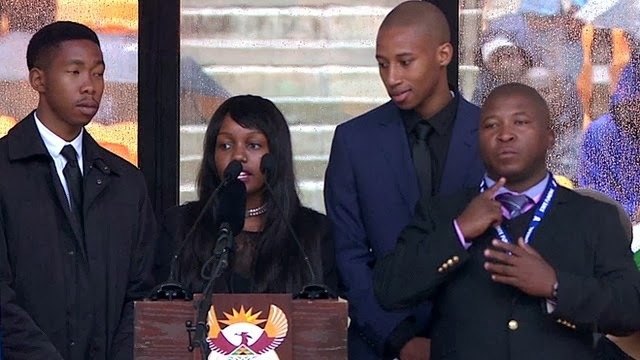 The outcry is loud that the man did not use South African sign language, was "not known to the deaf community or other interpreters in South Africa". South African sign language has its own structure and is not linked to any spoken language like Afrikaans, Xhosa or English, Mr Deysal told the BBC's Newsday programme. The BBC's See Hear researcher Erika Jones, also a sign language user, said the man's signing seemed to have no grammatical base and kept repeating sign patterns when it was clear that the speaker was not using repetitive words. Sadly on a day when the World saluted a man who fought for oppression, someone stood on stage effectively oppressing another minority ……. Daily Mirror in an updated report states that the imposter on stage had been identified and is named as Thami Jantjie. He was wearing an official security pass around his neck during the event at the 95,000-seater Soccer City stadium in Johannesburg, which is now being questioned as some of the 91 heads of state attended the funeral. People state that they were really upset and humiliated by the gesticulations and movements of the mystery interpreter.